The world we live in is fast-paced and constantly changing. With a new iPhone and Samsung Galaxy coming out every, technological advancements are constant including in the fabrication industry. With all of these advancements also means advancements in software. Mazak recently hired Chiaki Kako to join the software team that is growing at Mazak Optonics. Chiaki brings a lot to the Mazak team. 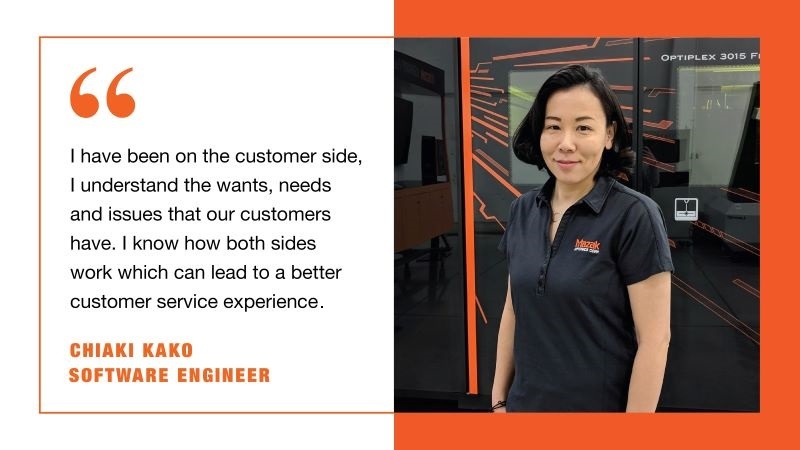 Tim O'Donnell, Software Supervisor, explains, "Chiaki joins Mazak Optonics with 13 years of experience programming in a laser production environment. We are excited to add her strong drive and self-motivating style to our software team." Learn more about Chiaki through this quick Q&A session. What is your background involving laser technology and the fabrication industry? “I graduated from Eastern Michigan University with a mechanical design degree. I like art but I wanted a degree in something that was more practical. I wanted to study industrial design but my school did not have it. So I went with mechanical design. I was a mechanical designer for more than 10 years in automotive, furniture and HVAC industries." "At my previous employer LB White in Wisconsin, I was originally working as a designer and it was a part of my responsibilities to make CNC programs for turret punch machines. In 2014, the company decided to purchase a fiber laser machine and needed a fulltime programmer. That’s how I got into laser. I handled not only the transition of programming and day-to-day tasks, but also a connection between nesting software and their ERP system to automate data transaction of laser work orders." "Moving from the Engineering to the Operation department, I realized that I needed to gain more knowledge on factory management. So I decided to go to graduate school to study Manufacturing Engineering. It was a great opportunity to gain hands-on experiences with the fiber laser technology at work while I was learning foundations of Manufacturing Engineering at school." What is your current role at Mazak? “At Mazak, I am a software engineer. 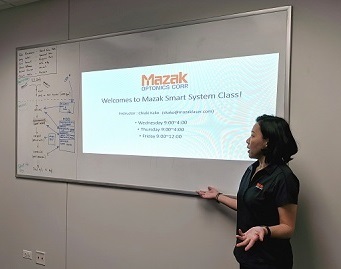 My responsibilities include training customers for Mazak Smart System (MSS) software, installing MSS on customers’ computers, assisting customers through customer service support and providing time studies for our sales team." "What I like most is seeing this other side of the business. I see why things are done a certain way and it is a new point of view and a new learning experience." “Providing effective solutions to customers in a timely manner is great customer service. Being able to promptly call customers back with solutions is ideal. But if I don’t immediately have the answer to their problem, I investigate to find the best solution possible." "I have been on the customer side, I understand the wants, needs and issues that our customers have. I know how both sides work which can lead to a better customer service experience." “I love art. I am an art nerd. Anything related to art interests me. I like taking architectural and historical tours. My favorite artist is an architect named Louis Sullivan also called the father of skyscrapers. He got famous in Chicago and one of his most well-known designs is the Auditorium Building in Chicago. Photography is another hobby of mine. I have a Nikon 900 camera." What is your favorite '90s jam and why? “Any songs by the Beastie Boys are my favorite 90’s jams. I never get tired of them. My sister had a cassette tape(!!) of Paul’s Boutique back in early 90’s, so I started listening to the tape and I have been a fan since then. I love any of their albums."